Red cooking or red braising refers to a classic slow braising Chinese cooking technique. Red cooking requires slow simmering for several hours with the ingredients being cooked mostly submerged in the fragrant spiced cooking liquid. The term “red cooked” comes from the dark red-brown color of the cooked items and its sauce. That deep crimson red color sometimes seen in red cooked items comes from a single ingredient, red food coloring, that is definitely not authentic and is not used here. Fatty cuts of pork, such as pork belly, are frequently prepared in this fashion, but leaner cuts like shoulder seem to be more popular with Americans. 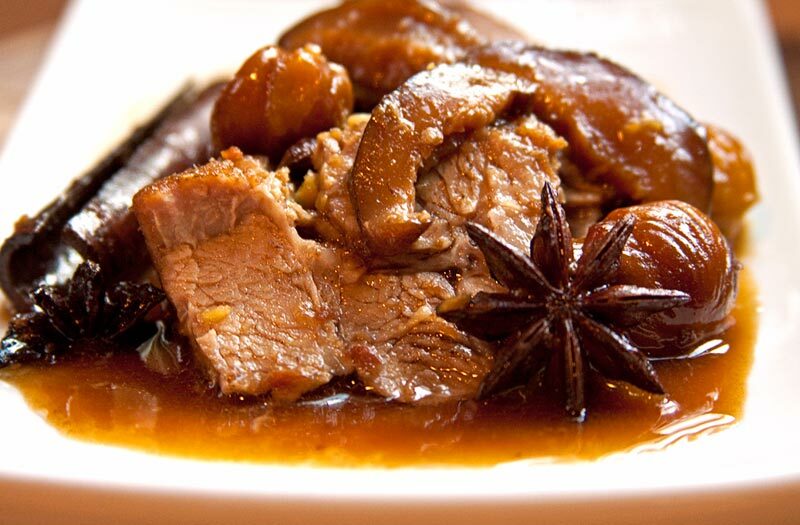 Red cooked pork is usually cooked along with other ingredients, here with whole garlic cloves, shiitake mushrooms and the fall favorite, chestnuts. Pork harmonizes beautifully with the richness of the chestnuts and the slightly sweet sauce of caramelized sugar, star anise, cinnamon and ginger. Dried red chilis add depth of flavor and not inconsiderable heat. Heat the oil in a heavy pan over medium-high heat and brown the pork on all sides. Remove the pork from the pan and set aside. Pour off a bit of the oil, reduce the heat slightly & add the sugar to the pan, stirring until it melts and bubbles. Stir until the melted sugar turns a rich caramel brown. Splash in the Shaoxing wine or sherry and bring to a boil. Return the pork to the pan and add enough water to nearly cover the pork, along with the garlic, ginger, sliced shiitake mushrooms, star anise, chiles and cassia. Bring to a low boil, then turn down the heat until it just simmers and cover tightly. Braise the pork for 1 1/2 hours and add the peeled chestnuts. Continue to cook for about 30 more minutes or until the pork is very tender. Remove the pork and turn up the heat to reduce the sauce. Cook on high until the sauce is reduced and slightly thickened. 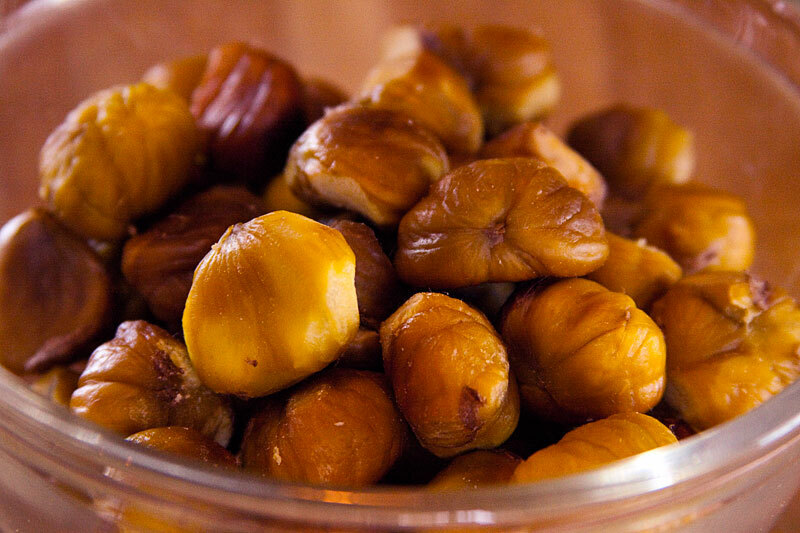 Slice the pork across the grain, arrange on plates and spoon the chestnuts and sauce over the top. I love the seasoning. What a juicy dish. Really yummy dish especially with pork belly. The fats will give the gravy flavour and keep the meat tender too. That’s astoundingly beautiful. I need to try it!